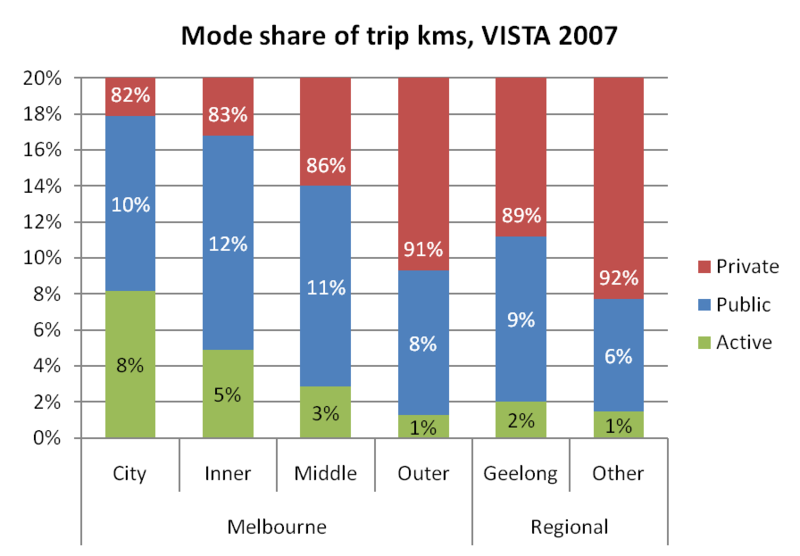 How does travel vary across Melbourne and regional centres in Victoria? What differences are there in car use by geography, income, household type, and age? And could you do more to reduce car use by pushing population growth to regional cities instead of the fringe of Melbourne? 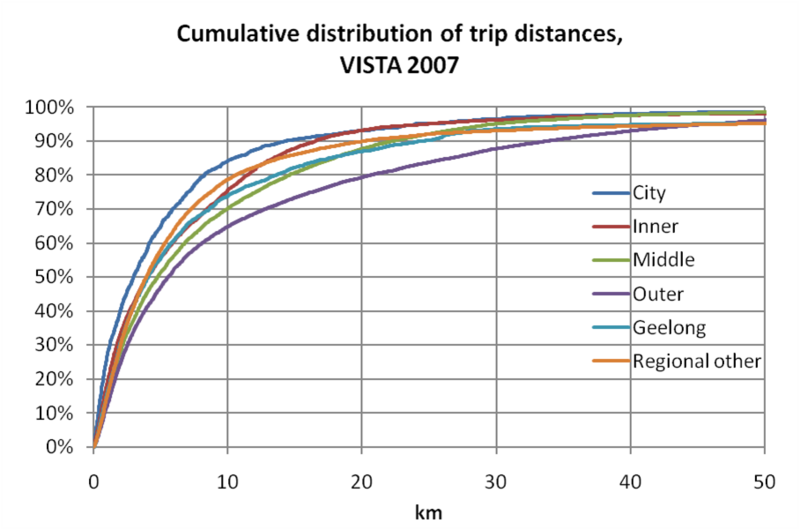 I thought I’d take a closer look at travel and trip distances using massive 2007-08 VISTA dataset, and see what factors lead to variations. 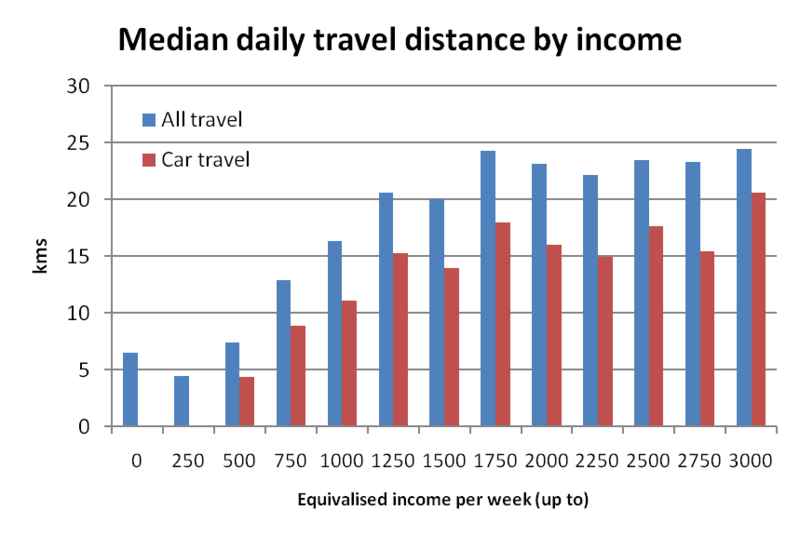 In this post I look at travel distances (total and by car) and mode splits across geographies, trip purposes, incomes, ages, and household types. And more. While the results might not be too surprising, I hope you’ll find the evidence interesting. How do travel distances vary by geography? The patterns were not uniform in the outer suburbs. Nillumbik is the second highest on 35.1 kms per person, while Hume is much lower on 19.6. Factors such as incomes and household types might explain this variation (more on that later). Note: I’ve used “city” as shorthand for the central area, and “inner” as shorthand for the inner suburban ring. This suggests little difference in total travel distance, but significant differences in car travel distances. I’ve not used averages because some trips were extremely long (the longest trip by an inner city resident was 833 km) which can skew the averages. How do you read this chart? 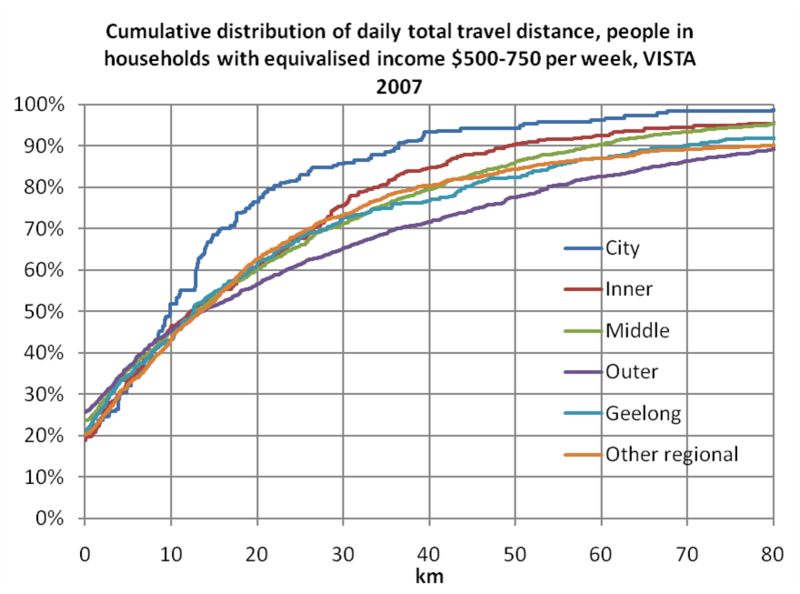 A point on each line means Y% of people travelled up to X kms per day. Essentially the lower the curve on the chart, the longer distance those people travelled. The lower half of travel distances were quite similar. The differences manifest in the top half of distances. 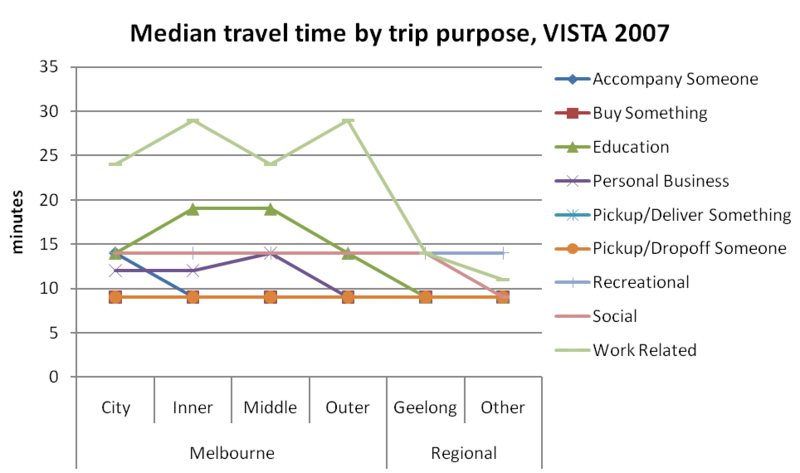 You can see that people in outer Melbourne were much more likely to clock up longer travel distances that those in the inner city. 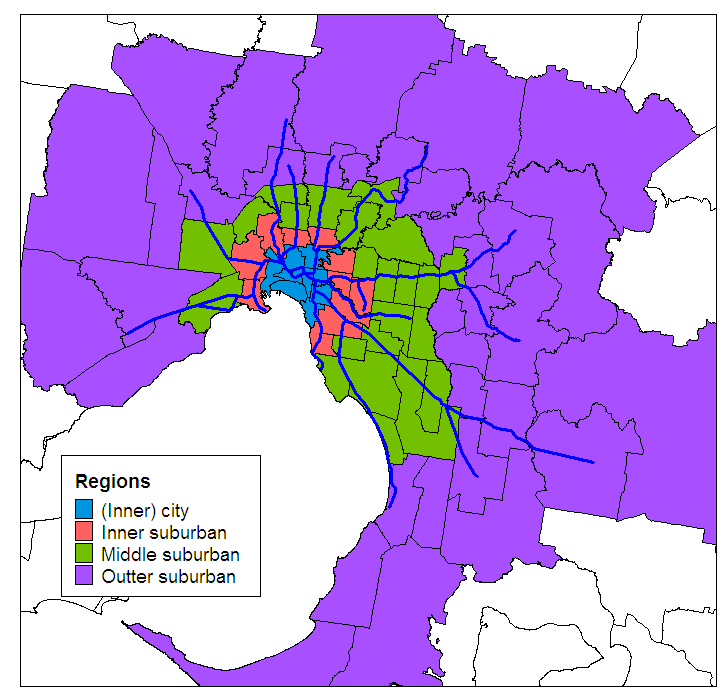 For example, 30% of people in the outer suburbs travelled more than , while only 15% of people who live in the inner city travelled more than 40 kms. 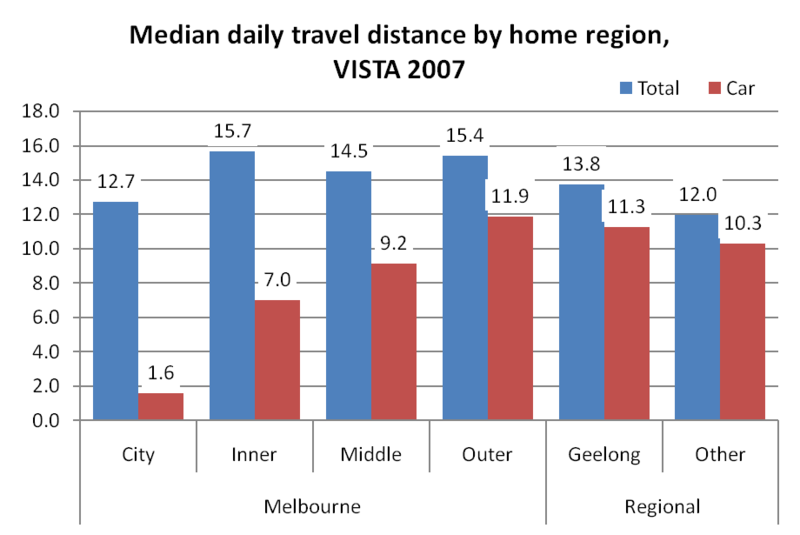 In fact, there were more long distance travellers in outer Melbourne than in Geelong or the other regional centres. 24% of people in the outer suburbs of Melbourne did not travel at all, while only 15% of inner city residents did not travel on the survey day. This causes the distances to cross around the median. There is greater diversity in travel distances of people in the outer suburbs, including about the quarter who did not travel. 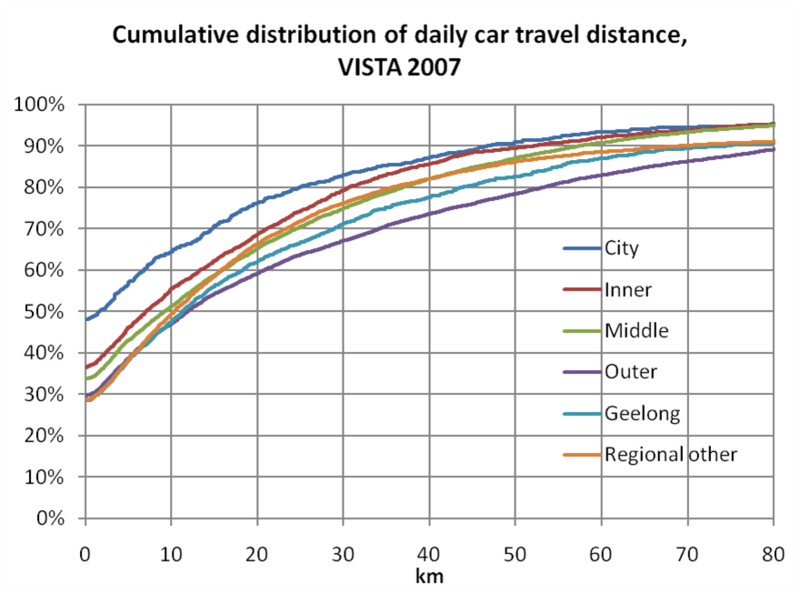 The differences are much clearer here, with car use and travel distance increasing through Melbourne by distance from the city, and the outer Melbourne suburbs having the longest car travel distances. 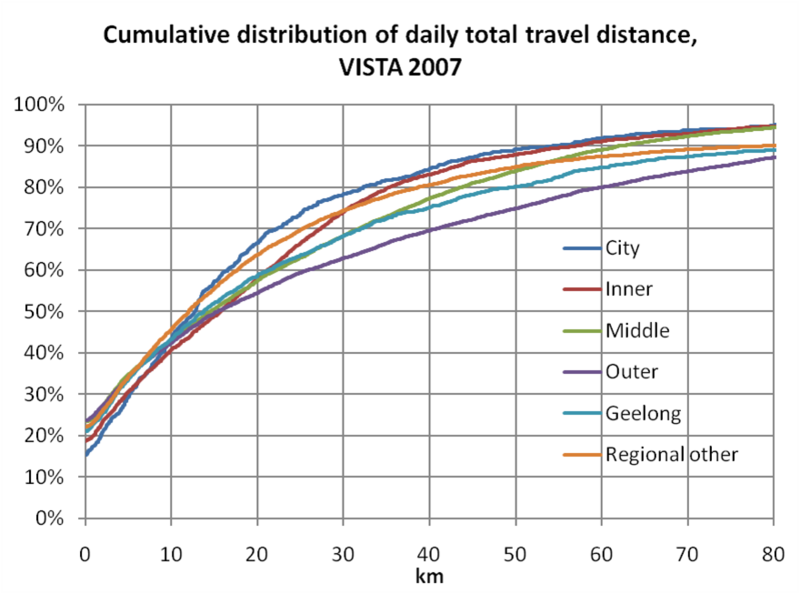 Distances in Melbourne’s outer suburbs are generally longer than in Geelong and the regional centres. Interestingly, 48% of inner city residents made no car travel at all, hence the very low median. While the city, inner and middle lines converge at a longer distance, the outer suburbs still had 10% of people doing more than 80 kms in cars. How does mode share vary by geography? 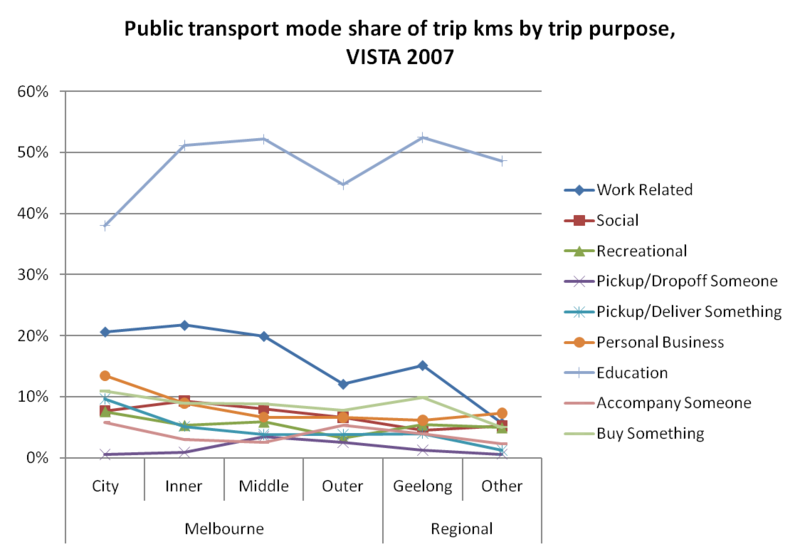 Active and public transport mode shares fell away with distance from the centre of Melbourne. I expect this will be a product of poorer service levels, and a smaller proportion of people travelling to Melbourne’s CBD (the main market where public transport dominates). 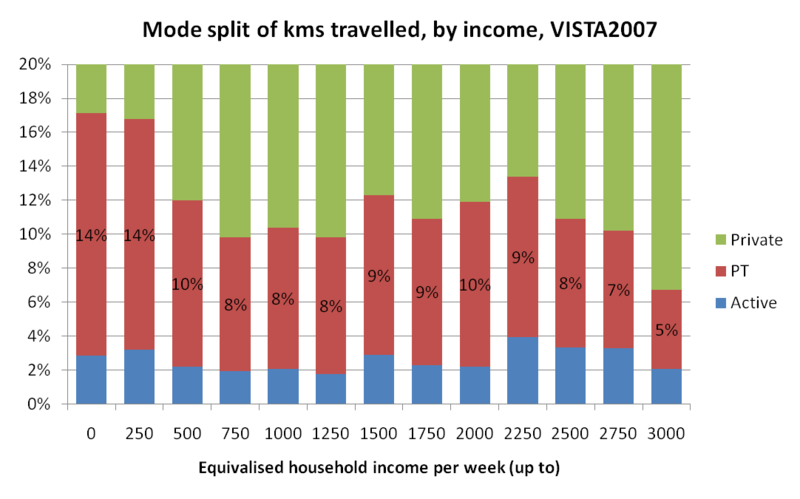 There is much less variation in public transport mode share of kms travelled. This points to people in the outer suburbs of Melbourne, Geelong and other regional centres making much longer trips when they travelled by public transport. I expect many of these will be long distance rail trips to Melbourne. The clear difference is that people in the outer suburbs and regional cities did a lot less walking/cycling and lot more travel by car. What about mode share of very short trips? Walking is a significant mode in the inner city, and many destinations are within walking distance. You might think that the regional centres are similar, because they are more compact in general. Well, it appears not. 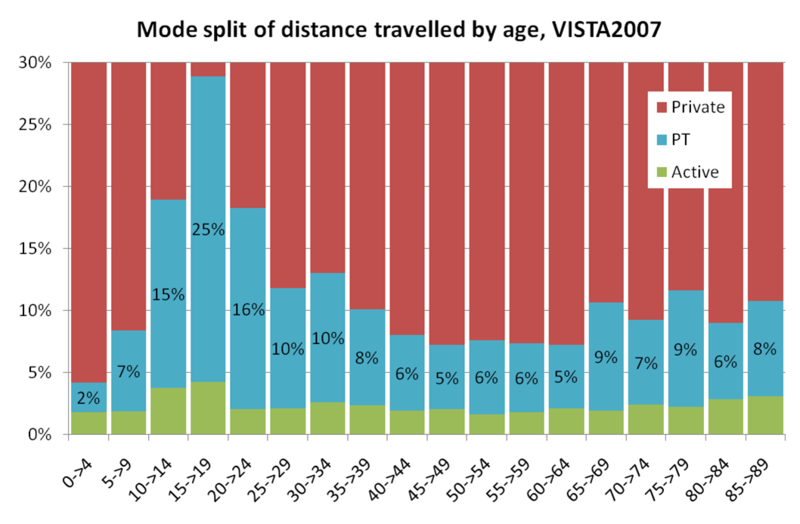 Here is a chart of mode shares of trips under 1km (probably a walkable distance for most people). Around half the short trips in the outer suburbs , Geelong and regional centres were made by private transport – essentially cars! Why did people drive for such short trips in these areas? Is it a lack of safe places to walk/cycle? Or is it a lack of disincentives to drive? Digging deeper, even for recreational trips of less than 1km in the outer suburbs, 30% were made by car! Does the number of trips made vary by geography? The following chart shows the distribution of the number of trips made. In VISTA, a trip is defined as travel between two activities. People in the inner city generally made more trips, and those in the middle and outer suburbs made fewer trips. This will also be influencing the total distance travelled per day. Note: very few people make only 1 trip in a day because it essentially means you start and finish you day in different locations (within the VISTA definitions of a day at least). How do trip lengths vary? 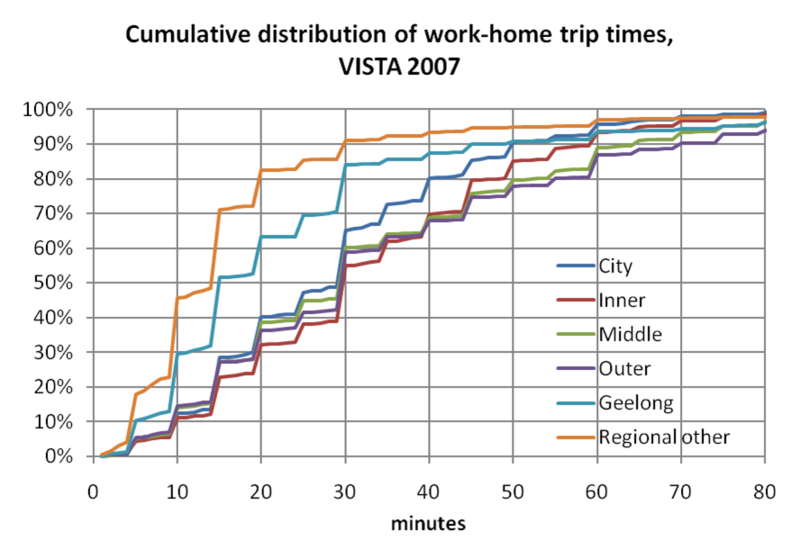 By almost any measure, those in the outer suburbs of Melbourne made the longest trips. They were followed by people who live in the middle suburbs of Melbourne and Geelong. This means that either people choose to partake in activities that were further away, or (more likely) those activities were further away from home. What about trip distances for different purposes? 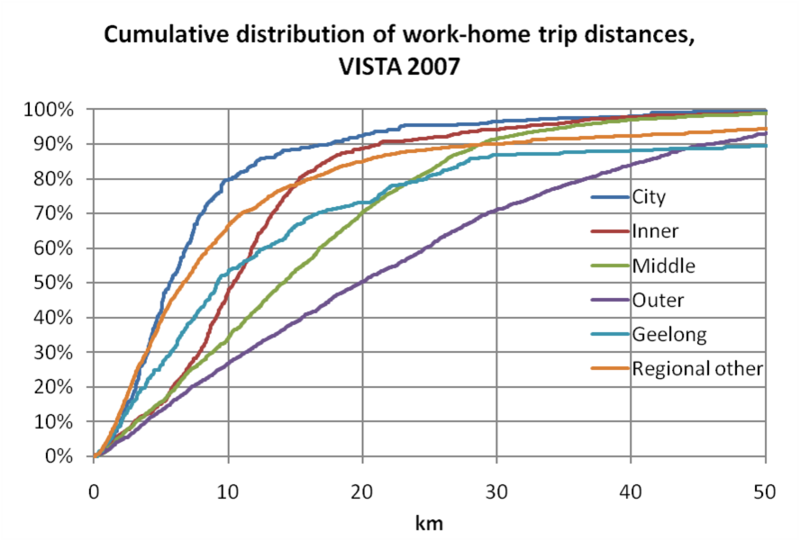 Work related trip distances were clearly the longest, especially in the outer suburbs. 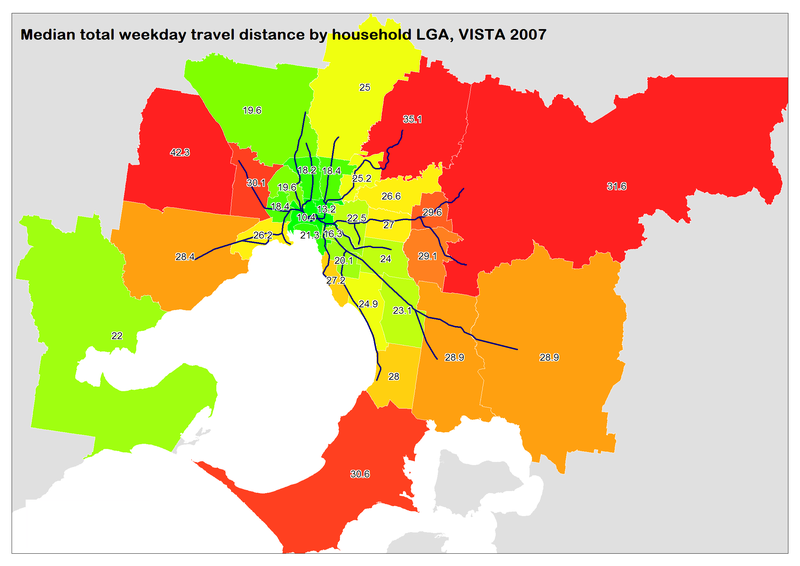 The “median” person living in the outer suburbs of Melbourne travelled 16 kms for work (note that not all “work related” trips are to/from home). The differences when looking only at home to work and work to home trips is much more stark, with the outer suburbs of Melbourne fairing worst by a long way. 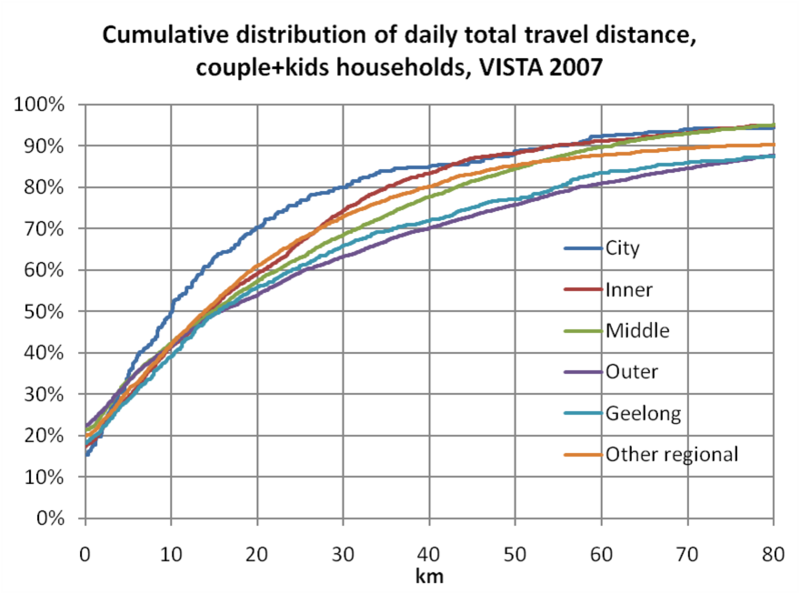 The median distances in Geelong and the other regional centres were actually less than the inner suburbs of Melbourne, however they have a long tail with over 10% of trips in Geelong more than 50km. Back to the previous chart, social trips also get longer as you move to the outer suburbs of Melbourne, which suggests that outer suburbs are not as self-contained for social destinations. 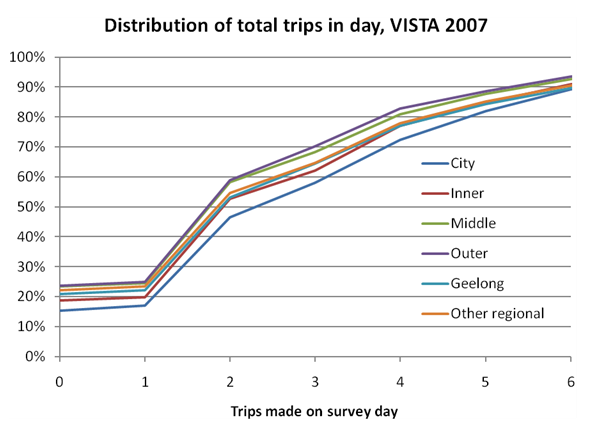 Most other trips purposes had a median around 3-4 kms, although this was more like 2-3 kms in the inner city, and distances increase in the outer suburbs. Chauffeuring trips (pick up or drop off someone) show the least variability (many of these would be taking kids to/from school). Trips to education were longest in the inner suburbs, possibly reflecting children from wealthy families attending private schools that are further away. How does travel time vary by trip purpose? Work trips take the most time in Melbourne, but there isn’t a lot of variation. This supports the hypothesis that people have a commuting travel time budget, and generally find work within that budget. Work travel times were highest in the inner suburbs (perhaps related to slower road speeds) and outer suburbs (much longer distances). 10 minutes was the most common median trip time – which actually shows up as 9 minutes in the chart, owing to the way I calculate medians in Excel (sorry, not perfect, but Excel doesn’t do medians in pivot tables). You can see big steps at the multiples of five minutes, as people tend to round estimated trip times to the nearest 5 minutes. 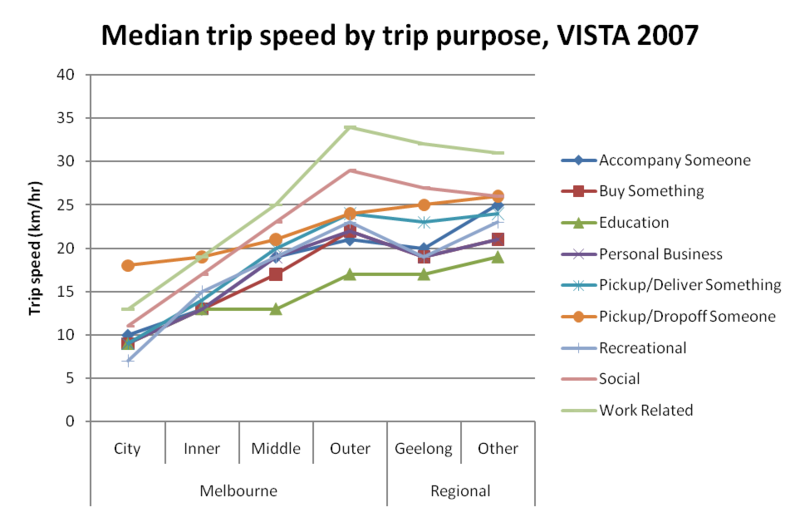 Median trip times in Melbourne are all around 30 minutes, and much lower in Geelong and regional centres. People in the inner suburbs were least likely to have commute trips less than 20 minutes, while the outer suburbs were most likely to have trip times over 30 minutes. How does travel speed vary by trip purpose? As you might expect, trips were faster in the outer suburbs, probably because a combination of less congestion and more roads designed primarily to move vehicles quickly (freeways and divided arterials). How does mode share vary by trip purpose? Around half of education trip kms were by public transport overall, although this was curiously lower in the inner city and outer suburbs. 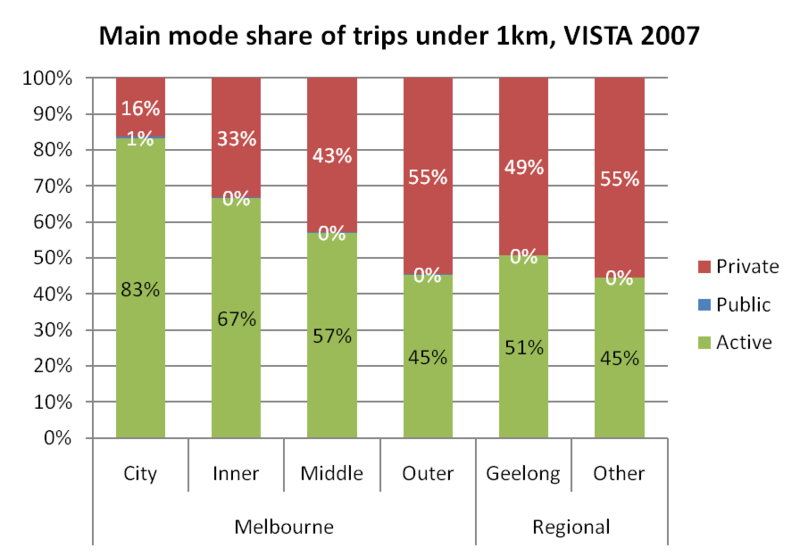 Work trips had the next highest public transport mode share, which fell away towards the outer suburbs. 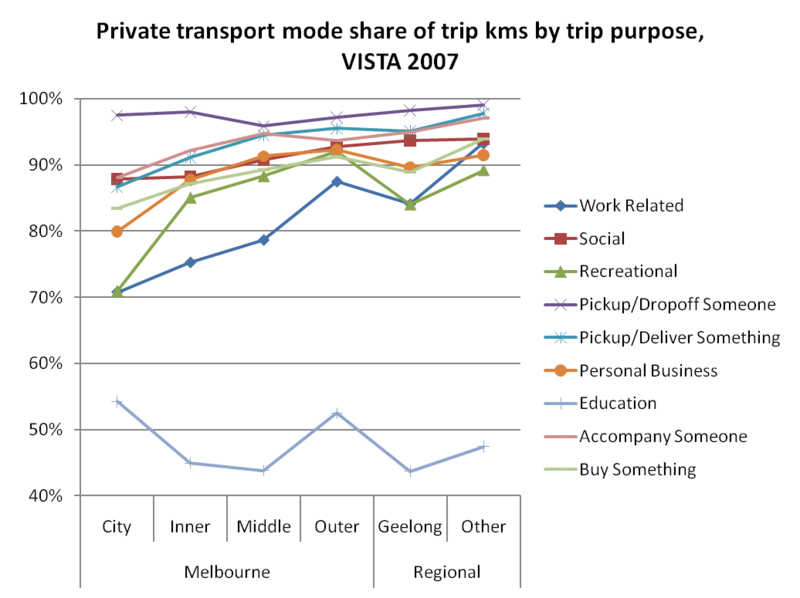 Other trip types mostly had slightly higher public transport mode shares closer to the centre of Melbourne. Note: I have not excluded very long trips from this analysis, so they might throw the figures slightly. You can see more significant trends across Melbourne, as people in the inner city and suburbs were more likely to travel by active transport. What other factors influence travel distance and mode split? 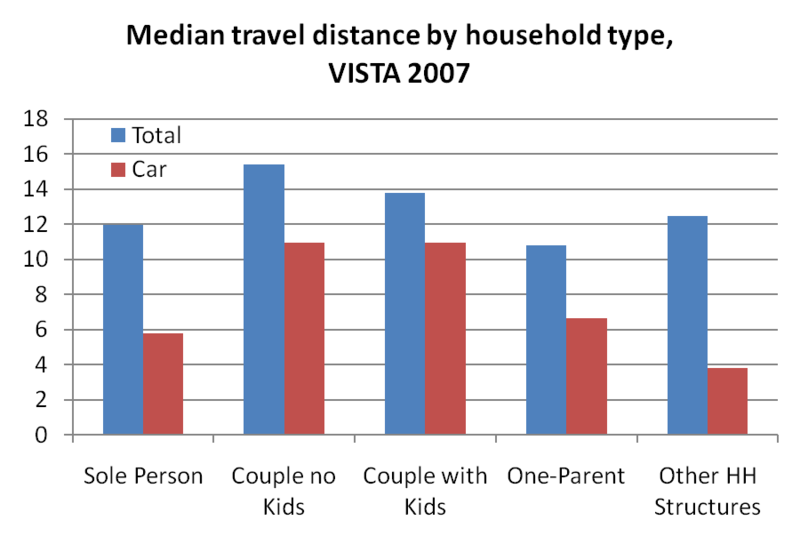 You can see that the household types more prevalent in the outer suburbs (couples with or without kids) have the highest median car travel distances. So this will be impacting longer travel distances in the outer suburbs. You can also see that couples with kids have the highest car mode share, which is no big surprise! Couples with kids in the inner city certainly travel less distance, and while the bottom half of people were similar for other regions, the travel distances were much longer in the upper half of such people, suggesting geography still had a big impact. Equivalised household income is a measure that allows income comparisons across different household sizes. It is calculated as household income divided by a measure of householders: the first person is assigned a value of 1.0, subsequent persons over 15 years are 0.5, and any children are 0.3. 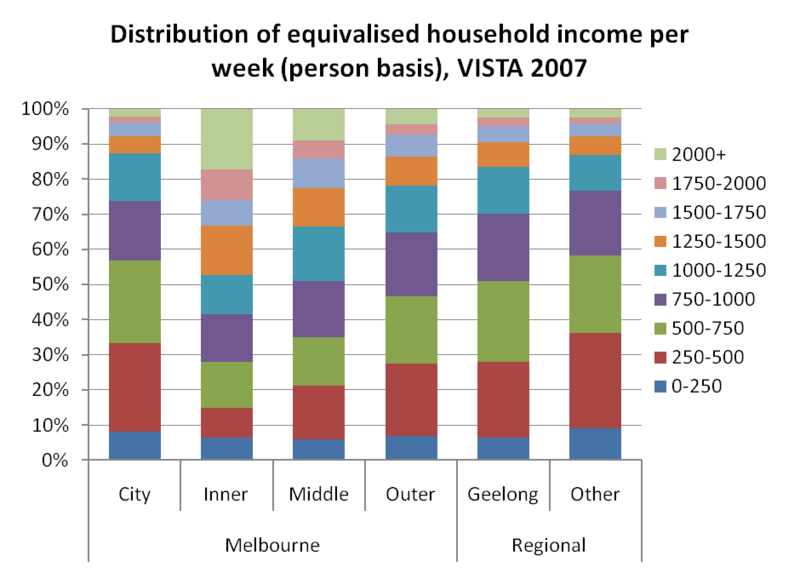 Curiously, the inner city has the lowest income profile in Melbourne (note that VISTA 2007 did not include Southbank and Docklands residents), while the wealthy live in the inner suburbs. Do rich people shun public transport? No, only the very-rich seem to shun public transport. According to the VISTA numbers (which are weighted to census 2006 demographics), only 10% of people live in households with an equivalised income over $2000. The highest concentration of wealthy people is in the inner suburbs, travel distances are generally shorter (although income might explain longer travel distances in relatively wealthy Nillumbik). Again the lower half exhibits very little difference, while the outer suburbs of Melbourne has much longer distances in the upper half. (note the inner city line is quite jagged, because the sample size in this instance is only 204). 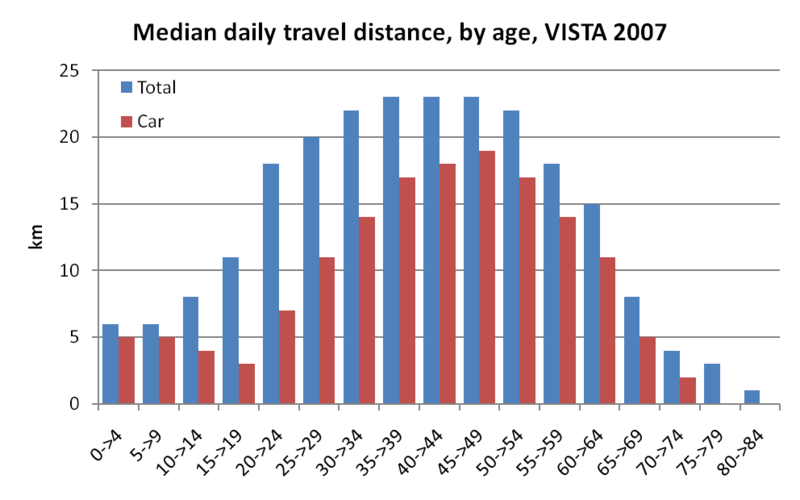 People aged 20-64 certainly travelled longer distances. 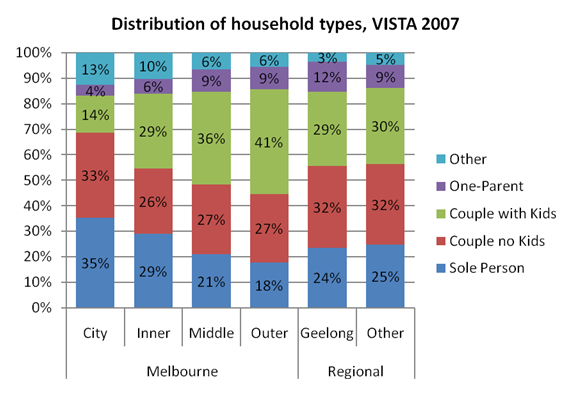 Looking at the distribution of ages, there were more people aged 20-74 living in the inner city and inner suburbs, compared to middle and outer Melbourne. There is very little difference in the percentage of the population between 25 and 64 across the regions (those with the largest car travel distances). 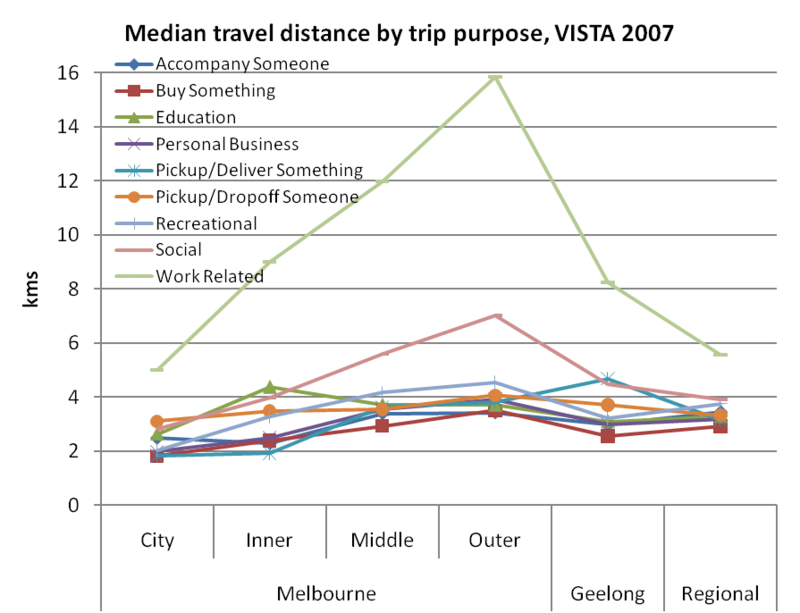 And finally (without going through all the detail here) people who work full-time tend to travel more, but they become less prevalent as you move away from the centre of Melbourne. So, should we encourage population growth in regional centres instead of Melbourne’s outer suburbs? Well, it’s probably the wrong question to ask! 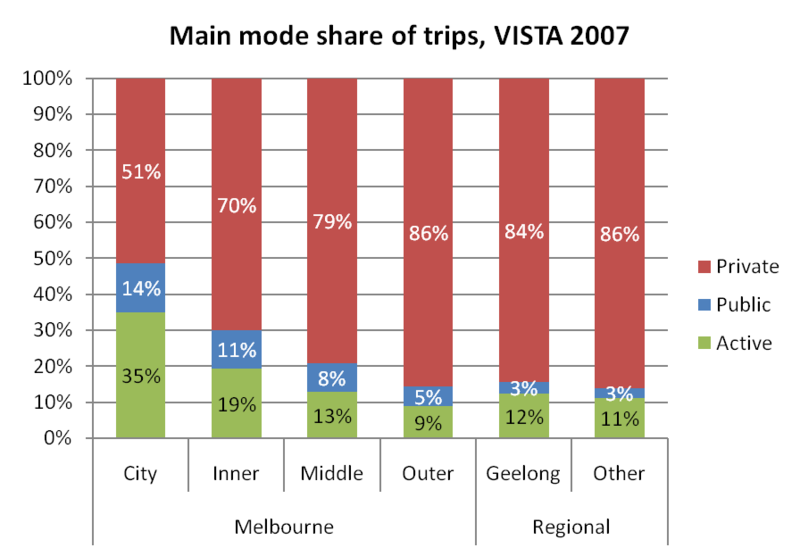 People in inner Melbourne do a lot less car travel than anywhere else. This analysis clearly shows that encouraging people to move into inner Melbourne would probably do the most to reduce car travel per capita. People currently living in the outer suburbs of Melbourne travel more and do more car kms than those in regional cities. The main problem is that their work and social trips are much longer. The evidence suggests putting people into regional cities would generate less car travel than putting people on the fringe of Melbourne. If you can generate jobs in the outer suburbs of Melbourne, you might be able to reduce work travel distances. Easy to say, but it defies agglomeration economies that cause jobs to co-locate in the inner city and suburbs. If Melbourne’s Central Activities Areas (formerly Central Activities Districts (formerly Transit Cities)) can become significant employment destinations then that will certainly help. If you do encourage people to settle in regional cities, will they have the same transport profile as existing residents? I would guess that there would be a significant difference between people living in the centre of regional cities, and those living on the fringe. The reduced car travel advantages of regional cities are probably largely eroded on the fringes of the regional cities. However, encouraging higher density in the inner areas of the regional cities would probably generate less car kms. If you increase the population in regional cities without also increasing employment opportunities, you’ll create unemployment problems and/or force people to travel further to get to work. This would cancel out some of the benefits of locating people in regional centres. It may also increase demand on long distance V/line commuter trains into Melbourne (which currently consume valuable metropolitan train paths with low passenger density). It doesn’t seem like there is much difference between the outer suburbs and regional cities. But there is a much bigger difference when you compare these with the inner suburbs of Melbourne. Increase public transport service levels in existing outer suburbs and regional cities, with a particular focus on efficiently connecting people to employment areas by public transport. Break down the barriers to walking and cycling in the outer suburbs and regional cities. Footpaths and safe places to ride would be a good start! Wherever possible I have used person weightings in VISTA, which are for all week travel and align VISTA data with 2006 census data on demographics. I have determined trip purpose by looking at the destination purpose of each trip. If the destination is not home, then I assign the destination purpose as the trip purpose. If the destination purpose is home, then I assign the origin purpose as the trip purpose. This gets around the common problem of nearly half of all trips having “go home” as the trip purpose, which costs you half your data when analysing by trip purpose. This entry was posted on Sunday, June 19th, 2011 at 11:04 pm and is filed under Melbourne, Mode share, Urban Planning. You can follow any responses to this entry through the RSS 2.0 feed. You can leave a response, or trackback from your own site. 2 Responses to How does travel vary across Melbourne and regional centres in Victoria? Excellent analysis and great charts as usual. Lots to mull over. One query: in your discussion of cumulative car travel, you say, “Interestingly, 48% of inner city residents made no car travel at all, hence the very low median”. I don’t get the relevance of non-travellers. Wouldn’t the appropriate measure be “X% of those who travelled by car travelled up to Y kms”? In all the analysis, I’ve intentionally included people who did not travel, as I’m trying to measure the amount of travel made and the amount of car use. The fact that 48% of people in the inner city made no car travel at all is very relevant to debates around densification, for example. Arguably new residents moving into median density developments along PT routes in the inner 4-5 kms would probably use cars even less because they would be right next to PT, and may well be making a deliberate sustainable transport orientated lifestyle decision. 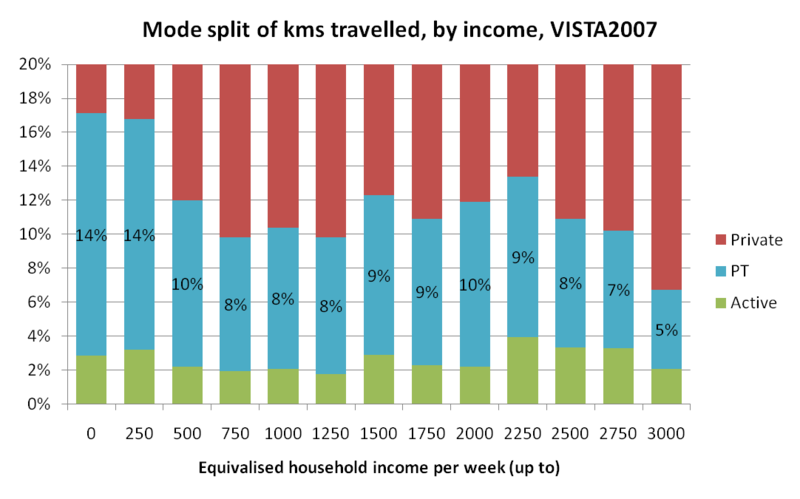 The chart also tells us that only 20% of people living in the inner city travelled more than 25km by car. The median car distance travelled of those who travelled by car would only tell me something about half the population who travelled by car. I’m concerned that many decision makers tend to fall into the demographies of older, wealthier and male, and we know those people tend to have a higher car mode share, and hence may be more likely to see transport problems from the perspective of their car windscreens. I really don’t want to reinforce that perspective of transport. Of course this won’t to all decision makers!